ABV – “Alcohol by volume” – is the percentage of alcohol (ethanol) that is contained within a liquid. Backins – Weak whiskey produced at the end of a double run or at the end of a run through a thumper. Bead – The bubbles that form on the surface of shaken whiskey and reflect the alcoholic content. Beading Oil – An oil dripped into low-quality whiskey by Prohibition-era moonshiners to make the alcohol bead like quality whiskey. Beer – The liquid part of fermented mash. Beer, also called “teedum,” was often made for its own sake rather than for distilling. Blackpot – A submarine still in which the mash is allowed to ferment directly in the still rather than in barrels or boxes. Boiler – Also called a “pot,” the container in which mash is initially cooked or heated. Bootleg Turn – A whiskey-hauler’s technique of turning a car around in a sudden controlled skid. Cap – The removable top of a still. Caps are named by their shapes. Carboy – is a glass or plastic vessel used in fermenting beverages . Usually it is fitted with a rubber stopper and a fermentation lock to prevent bacteria and oxygen from entering during the fermentation process. Charge – The act of filling the still or the thumper with beer or pumice. Condenser – The part of the still, typically a copper coil, in which the steam condenses into liquid alcohol. Corn – Whiskey made primarily from corn mash. Dropping the Bead – Also called “cutting” or “proofing,” the process of lowering the strength of liquor by mixing it with weaker alcohol or water. Double Run – The technique of running alcohol through a still twice. Flake Stand – The wooden water-filled box in which the condenser is cooled. Fermentation lock – Also called air lock. Is a device used in beer brewing and wine making that allows carbon dioxide released during fermentation to escape the fermenter, while not allowing air to enter the fermenter, thus avoiding oxidation. Fermenter – Container used to Ferment wash. Carboy or air tight food grade pail is often used. Gauger – A revenue agent in the pre-Prohibition era. Granny Fee – Bribery or payoff money paid by moonshiners to law enforcement officers. Liquor Car – A car modified to haul illegal alcohol to market. Malt – Barley malt for mixing in mash. Corn that is sprouted and then ground can be used in place of barley malt. Mash – Some combination of water, grain, malt, yeast, and sugar that is allowed to ferment before being distilled into alcohol. Peckin’ the Cap – A technique of rapping on the cap to tell by the hollow sound if the mash has boiled into the cap. Pumice – Crushed fermented fruit and sugar used to make brandy. Revenuer – A government agent whose job is to catch people involved in moonshining. Reflux – Reflux is a distillation technique involving the condensation of vapors and the return of this condensate to the system from which it originated. Runner – A person who hauls moonshine. Singlings – Un-proofed whiskey that has gone through one distilling and will be distilled again. Steam Outfit – A still which uses steam rather than a direct flame to heat the mash inside the pot. Still – The combination of the cap and boiler in which the mash is initially distilled. 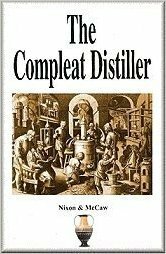 “Still” is also used to describe the entire distilling setup. Still Hand – A person who works at a still site. Stillhouse – Historically a small permanent building constructed specifically for distilling. Stir Stick – A stick with a fork at the end used to stir mash. Wire is commonly stretched back and forth across the fork. Submarine Still – A large-capacity style of still in common use since the 1920s. Shaped like a low box with two curved ends, the submarine still usually has two wooden sides. Swab Stick – A bristled wooden stick used to clean out a still. Turnip Still – An old style of still pot that has a round, squat shape. Worm – A coil submerged in a water-filled container. Alcohol-laden steam condenses to a liquid in the coil. Yeast Starter – A yeast starter is used to initiate cell activity or increase the cell count before using it to make your beer. The yeast will grow in this smaller volume, usually for 1-2 days, which then can be added to 5 gallons of wort.